John Barbour was the founder of Barbour brand in 1894. Everything started from the supplies of functional and qualitative clothing for the workers in the north east. Upon decades of development, Barbour managed to occupy the position of a strong clothing business, which is family-owned and taking inspiration from the British countryside. The beginning of the popularity of this brand dates back to 1936, when Duncan Barbour presented the first motorcycle suit, which is known under the name the Barbour International. The popularity of this suit made the actor Steve McQueen wear it during the competition in motorcycle trials. 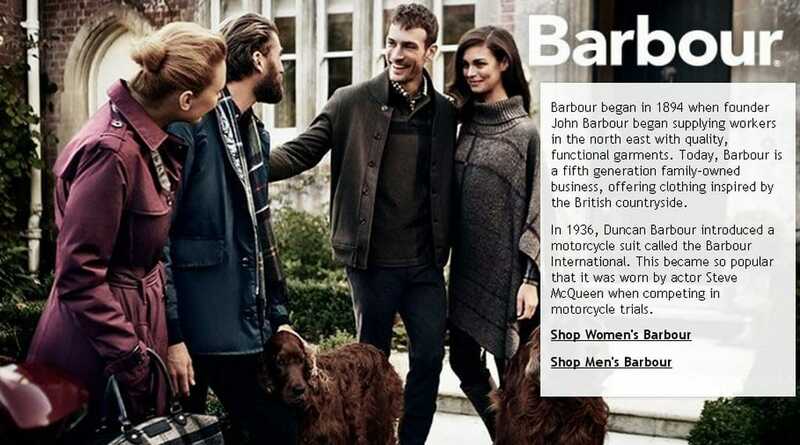 Nowadays the collections by Barbour include garments for ladies, men and children. For women there is a huge choice of jackets. For example Barbour Iconic International style made in our signature Polarquilt combination. This is a plain jacket, suitable for casual wearing during colder weather. Single breasted with funnel neck it is simple and comfortable. For nasty weather, but warm moods, choose the open knit, chunky and lofty, raglan crew neck oversized sweater with zipped raglans jumper. It would easily become a part of your everyday outfit, just to wear with jeans. More sophisticated is this lovely ponte sweat piece with printed woven front panel in a `watercolour`. It would suit any wardrobe, matching any trousers or jeans. If you don’t like cold weather and wind, pay attention to the hooded and belted international jacket with fleece lining. The jacket is of standard length and with waistbelt, which contributes to saving warmth. There is a detachable hood and sophisticated detail on the collar stand for more stylish look. Inside part it is made of contrast fabric, making the jacket look not gloomy. For creating warm and romanticized image, consider fine gauge crew neck with contrast color piping and shoulder zip opening.